Here’s a new article from our seed production research and extension team on spring nitrogen and seed yield in winter canola. Field trials were conducted in the Willamette Valley over a 3-year period at OSU’s Hyslop Farm. This work was led by Brock Ferguson and is the first study to be published on winter canola in the seasonally wet environment of western Oregon. Ferguson, B.T., T.G. Chastain, C.J. Garbacik, B.T. Chastain, and D.J. Wysocki. 2016. Spring nitrogen and cultivar affect seed production in winter canola (Brassica napus L.). Agron. J. 108:1124-1131. Spring nitrogen increased seed and oil yield in winter canola except when the crop was lodged as a result of high spring rainfall. 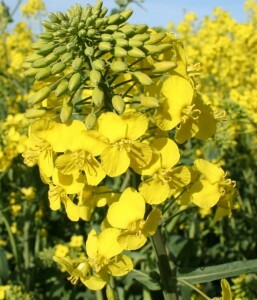 Seeds m-2 was the most influential factor in determining seed yield in winter canola. Seed oil content was high but was inversely related to the rate of spring N applied. Seed yield and oil yield were maximized at 100 lbs N/acre while minimizing lodging losses. Posted in Nutrient Management, Oil Seed Crops, Seed Production.